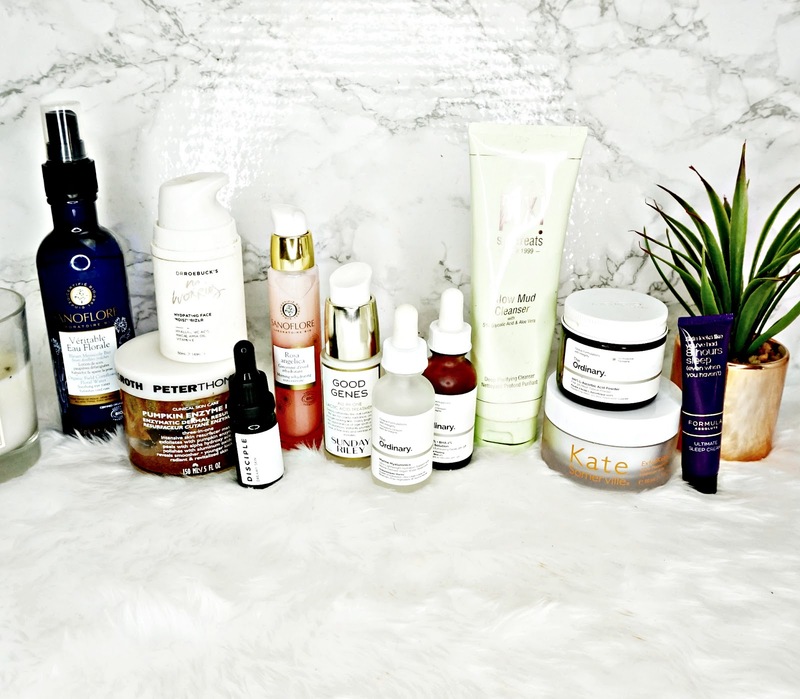 Buying skincare can be a daunting task. There's just so much on the market it can be so confusing. It can also be hard to know whether to splurge or save on skincare. Buying super expensive skincare and realising it's rubbish can be very disappointing. I've put together a little guide of skincare that really works and broken it down into price points. Please note that skincare can be very subjective and what may work for me may not work for you. And for reference I have dehydrated skin. So without further ado. Kicking things off with my favourite affordable serum! This is packed with hydrating ingredients that are extracted straight from marines. These extracts hold water, like Hyluronic acid but it has a much lighter texture. This is really water and I personally find this much more hydrating than Hyluronic acid. It absorbs really quickly to, leaving my skin plump and hydrated. The rest of my skincare layers brilliantly over the top of this to! I use it in the morning and evening. This easily rivals some much more expensive serums to. Another affordable favourite that is a staple in my routine is this revolutionary powder. L-sorbic acid is a form of Vitamin C which is a great anti-oxidant that also brightens the skin and helps the appearance of uneven skin tone. This powder is to be mixed with another product before application, I use this with Klairs Supple Preparation toner. I like to use it in the evening and the results are really quite incredible! It really helps to brighten the skin! I use it twice a week and this has really helped with dullness. I think this is helping to improve the Red marks that I have from left over blemishes to. Regular readers will be sick of hearing about this AHA treatment but I couldn't do a post like this without including it. I can't get over how good this is for the price. This is essentially a mask that uses AHAs and BHA to gentle exfoliate the skin. Revealing younger, brighter, more refined looking skin. It really does everything it claims. Instantly my skin looks so much brighter, feels smoother and has a radiant glow to it! I really can't recommend this enough. I know everything I've in this category is from The Ordinary but it really is a great affordable brand that uses brilliant ingredients at a low cost. Next from them I have this moisturiser that uses ingredients that are naturally found in the skin to add hydration. And this really is hydrating. It has a strange bitty texture, but don't let that put you off, this melts into the skin. Adding lasting hydration without leaving it sticky or oily. It works really under makeup and layered over other products. In terms of what this actually does to the skin it really does just add hydration which I really like, I tend to use serums and treatments if I want to tackle other problems, This is a great fuss free moisturiser. Mid-price skincare is where it is at for me personally. I just find that you get better products that work and it's kind of a safe middle ground between the super expensive and super cheap. I've tried to only include products in the £20-£30 price bracket, but it all depends on the product for me. But anyhow here are my picks. Sanoflore is a brand I've only recently discovered but I've seen a great result already. This mist in particular has become a favourite of mine. This spray is designed to help the eye area, it soothes and hydrates dry itchy eyes. Which I have been suffering with this summer. The directions say to spray this onto cotton wool and apply to the under eyes and eye lids, this way does work really well. But I just like to spray this on throughout the day when my eyes become itchy. It instantly soothes them while being hydrating. The mist is super fine and works really well over makeup to. It's become a summer essential. Another product from the brand I've been super impressed with is this hydration serum. It has a silky texture that absorbs quickly into the skin, adding instant hydration. It's also really light weight so I like to use it as part of my morning skincare routine. It really helps to keep my skin plump and smooth. It makes a great base for my other skincare products to. This night cream is a brilliant mid-price product, that I would have expected to be way more expensive! This is an uber rich cream that uses range of ingredients that work together to plump, sooth, replenish and hydrate the skin. The texture is on the thick side but it doesn't feel heavy on the skin. It's a real pleasure to use. It instantly adds hydration and with continued use this has really helped the overall appearance of my skin. My dry areas aren't as dry and my skin feels so soft. For £22 this is definitely one to check out. Pixi is a great mid priced brand, I don't think I've ever been disappointed with their skincare. This cleanser in particular is fab. It uses AHA to deeply cleanse the skin in a super gentle way. This has a very thick consistency and because this contains AHA I use this as a second cleanser, after I've removed my makeup. This literally gives my skin the most amazing healthy glow to it! And instantly leaves it feeling so smooth. I don't use this everyday just because I like to use a few different AHA treatments and I don't want to over exfoliate my skin. But overall, this is a great cleanser. I've been using this product for such a long time and it's still one of my favourite night time treatments. This is a rich nourishing mask that I like to use as a last step in my evening routine. It acts as a seal to ensure all the other products work. Alongside that this is intensely nourishing. My skin always looks more plump when I use this. If I have any dry patches this gets rid of them overnight to! I can't see myself without this cream ever! I've been banging on about this Moisturiser quite a lot recently but this really is a good one! It's the most perfect day cream for summer. It's very lotion like so it absorbs quickly without feeling heavy, sticky or oily on the skin. But this is so hydrating, which my skin really needs. Ingredients wise this contains the big guns, such as Hyluronic acid, Macadamia oil and Fruit oil and no nasties. I really can't recommend this enough. Last but not least in the mid-priced category I have this oil from Disciples which is amazing! It contains all the hydrating ingrediants as well as soothing ones to help stressed out skin. It's so nourishing and its light texture absorbs quickly into the skin. Leaving it soft, smooth and hydrated. I love how this doesn't irritate my skin at all. It's a fab little oil. This is one pricy mask but so worth it! This is another AHA mask that works in just 3 minutes and the results in that tiny time are incredible. At first this did really tingle on my skin and I couldn't keep it on for longer than a minute but skin has gotten used to it. After removing this my skin is so smooth, this literally melts away any texture issues. It also has scrubby particles in it for extra exfoliation when removing. Plus this smells super yummy to! Another eye wateringly expensive product but that really delivers results is this multi-tasking treatment from Sunday Riley. It can be used as a mask or an overnight treatment. I like to use this overnight because it's super expensive and I want to leave it on my face as long as possible! This is another product that uses AHAs but this uses Lactic acid which is more gentle than Gylocic and personally I find Lactic Acid more effective on my skin. This doesn't tingle or anything like most AHA treatments but that doesn't compromise the results. It really makes my skin smooth and more radiant looking, even after one use. AHA's are also well known for their ability to prevent ageing and fine lines to. Lastly in the high-end category I have this Kate Sommervile moisturiser which is another product that uses AHA (I'm seeing a recurring theme here) but what makes this one special is how hydrating this is! I don't have anything like this in my collection! And this really does give the skin a healthy glow to it. It can be used in the AM or PM but I like to use it in the evening because it is quite rich, it's not heavy or anything I just don't think this would work well under makeup. That aside this works amazingly to give the skin hydration while giving it amazing radiance! It really is worth it's price tag. There are my favourite products that deliver results from every price point. Have you tired any of these? What are favourite products that deliver?